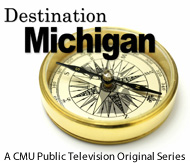 Providing barrier free pontoon boat to physically disabled at NO CHARGE in Otter Lake, MI.. Barrier Free Boating is a Michigan 501(c)3 non-profit organization that provides the use of a pontoon boat, FREE OF CHARGE, so that physically disabled individuals and their families, veteran's groups, group homes and youth organizations will have the opportunity to enjoy the activities of boating and fishing. The custom made, barrier free, 22 foot South Bay pontoon boat, specifically designed to accommodate up to three wheelchairs and a maximum of 1550 pounds, will be available for use from May 15 through September 30 yearly. The pontoon boat has 25" pontoons, the largest available to provide maximum stability and is powered by a 25 horsepower Yamaha motor for a speed of 6 - 8 miles per hour. Please click on the link below to view a video explaining the program and see the boat and custom built dock. Barrier Free Boating is located at the Otter Lake Village Park, Otter Lake, Michigan. Otter Lake Village Park has a campground, boat launch, beach, picnic area and a pavilion. Handicap accessibility includes sidewalks, bathrooms, and specialized tables and grills. The Village of Otter Lake generously donated shore space so we were able to construct a custom built, wheelchair accessible fishing platform and boat dock for our pontoon. You may provide your own pilot/operator. The pilot/operator must be at least 18 years of age, have a valid driver's license, a Boater's Safety Certificate and must download and sign the Pilot Agreement Form. All new pilots must fill out the Pilot History Form and be pre-approved by our insurance carrier. 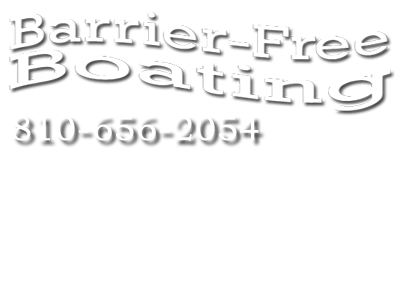 Copies of the Boaters Safety Certificate and Valid Drivers License, signed Pilot Agreement Form and completed Pilot History Form must be submitted to Barrier Free Boating via email, FAX or US Mail at the same time you reserve the boat (this is a requirement of our insurance carrier as it relates to liability). We would like to acknowledge and gratefully thank The Filippis Foundation for awarding Barrier Free Boating a $2,500.00 grant on June 12, 2014. The grant was used to purchase a pontoon boat trailer. This will allow us to take our boat to other area lakes and provide our service at various events hosted by organizations dedicated to the disabled. Barrier Free Boating can always use more volunteers. If you are interested in becoming a boat pilot, helping at events or have computer skills, please contact us. We would look forward to talking to you.